After the tip, we go backstage where Leslie shares, An introvert’s story, The Voice Pro journey, An exercise in clarity, and more! 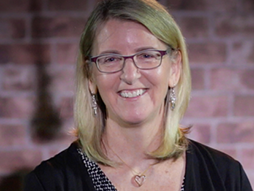 I’m Leslie Dickson, President and CEO of VoicePRO. Today I’m going to share with you the four key components of gaining your personal credibility. Credibility is one of those qualities that everybody wants and it is attainable. So the word, credibility actually comes from the Latin root word credere, which means to believe. So, if you’re credible, you are believable. The challenge plays out in the fact that everybody else determines whether or not you’re credible. You can’t decide yourself that you are, you have to rely on others to decide. Integrity is the first key component that makes up your credibility. What does integrity mean? Integrity means your honesty, your trustworthiness, and most importantly your follow through. So you do what you say you’re going to do, when you say you’re going to do it. The third component of credibility is dynamism. What is dynamism? Dynamism is your passion, your conviction, your enthusiasm about what you’re talking about. If you cannot convey that you care about what you’re saying, nobody’s going to believe you at all. The fourth component to credibility is your openness. Now that really plays out in two different ways. One is being open to input, or ideas, or viewpoints of other people. So you’re open to hearing what they bring to the table. The second piece is opening yourself up. You know we all want to come across as being perfect, and professional, and excellent at what we do. But allowing yourself to be vulnerable and to let perfect go, actually will enhance your credibility immensely. So now you know the four key components that will convey your personal credibility. But the challenge here is not only do you need to have these qualities yourself, because that will make you a good person, you have to convey them. You have to show other people that you have these qualities. If you show them, they will believe you and you will then have credibility yourself. As President & CEO of VoicePRO and a former biologist working in biotechnology, Leslie is no stranger to the unique challenges facing business leaders. Leslie is an in-demand executive coach. Her clients recognize that she has an affinity for identifying specific issues, while possessing the expertise to resolve them. Click here to find out more about Leslie Dickson.